Kincardine Family Eyecare offer a wide selection of contact lenses including disposable soft contact, bifocal/multifocal, toric, gas permeable and colored lenses. Whether you wear daily, weekly or monthly disposables, or conventional (vial) lenses, check out our selection of lenses that fit your needs. 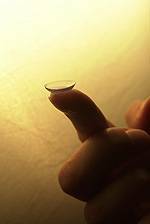 See a short video about contact lens safety and tips for reducing your risk of injury or infection. Proper lens care and handling techniques are important to minimize eye injury. Presented by the U.S. Food & Drud Administration.